1. Cook the pasta in boiling water for 11 minutes or until tender, then drain and return to the pan. 2. Meanwhile, boil the peas for 2-3 minutes and drain. Place half the peas in a small food processor with the mint and lemon juice, and purée. 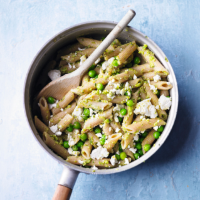 Stir into the pasta with the remaining whole peas and cheese, and season to taste. This recipe was first published in Thu Jul 30 10:51:00 BST 2015.